I see you’re using circular needles. I never knitted in the round with something else than double pointed needles. How do you managed to knit small pieces on circular needles? There is no good or bad way to knit in the round. As there’s no good or wrong way to hold your yarn. I can’t emphasize that enough. Whatever works for you is the right way for you. In the contrary, if you’re struggling to keep an even tension or if you’re getting loose (or too tight) stitches at some point, try another one, I bet it will almost magically solve your problem! It might be the most intimidating technique in all the ones we will talked about this month but trust me, it’s not the most complicated one. At all. You can use either 4 or 5 double pointed needles. I do prefer to use 5, this way you have your stitches on 4 needles and use the fifth one to knit them. I find it easier because it allows your stitch to form a tube. The only thing you have to do is knit the stitch as they are with your spare double pointed needle. 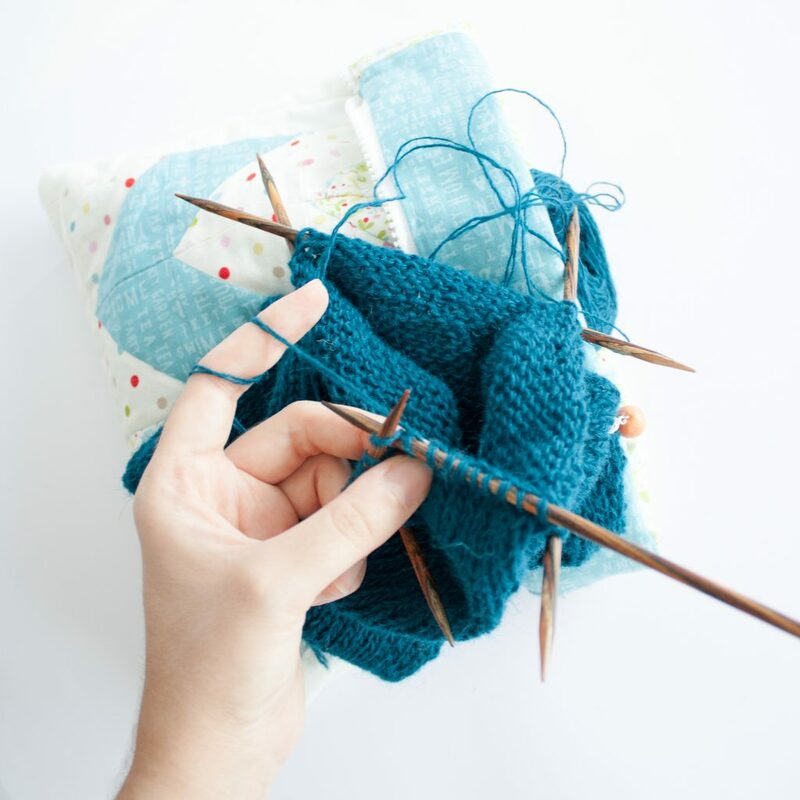 All your stitches stay on 3 or 4 needles and you’re knitting one needle at a time. I soon realized double pointed needles are not my cup of tea. I had a column of loose stitches at every needle start. Not pretty! I’m a loose knitter and I find it difficult sometimes to keep my tension even enough with dpns: either I was too loose or not enough. I still use them once in a while, mostly for sleeves (urf, sleeves!) but it’s definitively not my go-to technique. 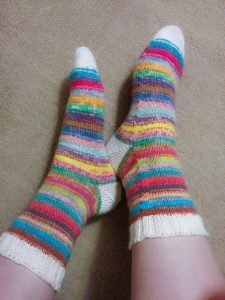 To talk about it, I invited Fanny the dpns expert and lover / best techeditor in the world / sock addict to join me on the blog. 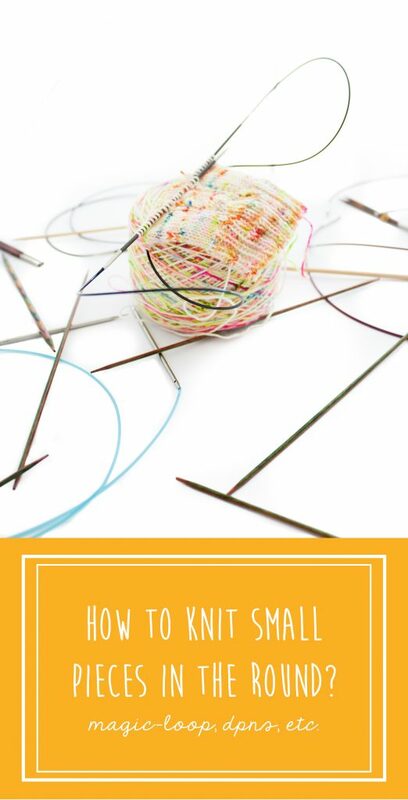 If you want to knit small pieces on circular needles there’s two main techniques you can use: the magic-loop or the 2 circ method. Or you can cheat and use tiny circular. The general idea of the magic-loop is to work your round one half at a time. We took advantage of the cable flexibility to hold half of the stitches while we’re working on the other one. 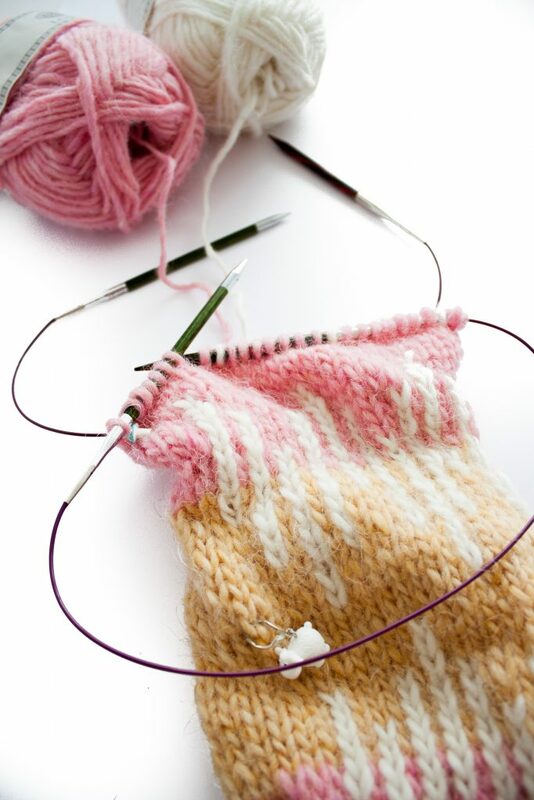 Once you reach the end of it, you’re simply switching places: the ones you just finished go onto the cable and those which were obediently waiting for you go on the needles, ready for you to knit them. Don’t be desperate yet if neither dpns or the magic-loop fit you. There’s alternatives. The simplest one is to use circular needles with a really short cable. The only I know about are manufactured by Addi. They’re exactly as their big sis’ but have a really short cable: 20 or 30 cm. The needle tips themselves are short too. Mine are only 4.5cm long! The needle tips are in metal and I prefer to use wood/bamboo or carbon ones. When I knit, I place all my fingers on the needles. Let me tell you, with needles tips as short as they have, there’s no way I can do that here. They have a really round tip. I know some knitters do prefer it that way but I like pointed tips. 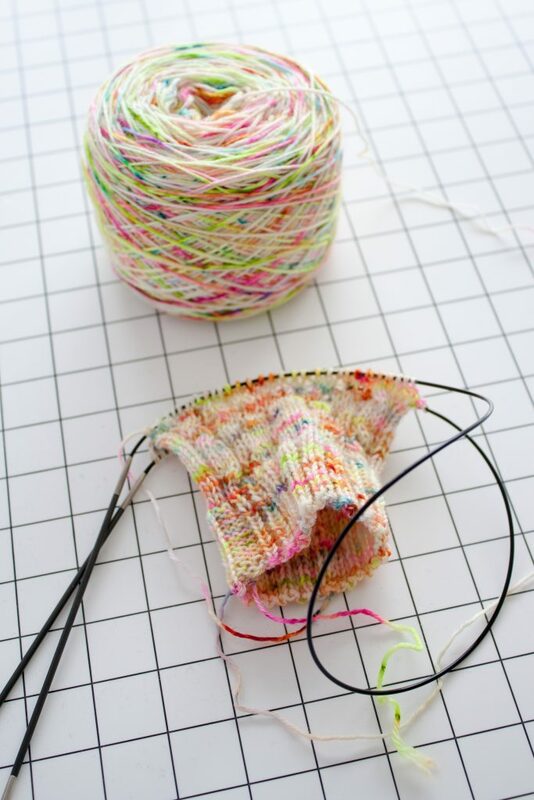 With such a short cable, you’re not able to knit the whole sock with only one needle. You need a spare needle to knit the heel and maybe the toes. In my opinion this in their major flaw. But, for the metal needle likers, they’re a good way to knit sleeves, legwarmers or event hats without too much troubles. I consider this as a cousin of the magic-loop. It rests on the same principle as the magic-loop: you knit one half of the round at a time. 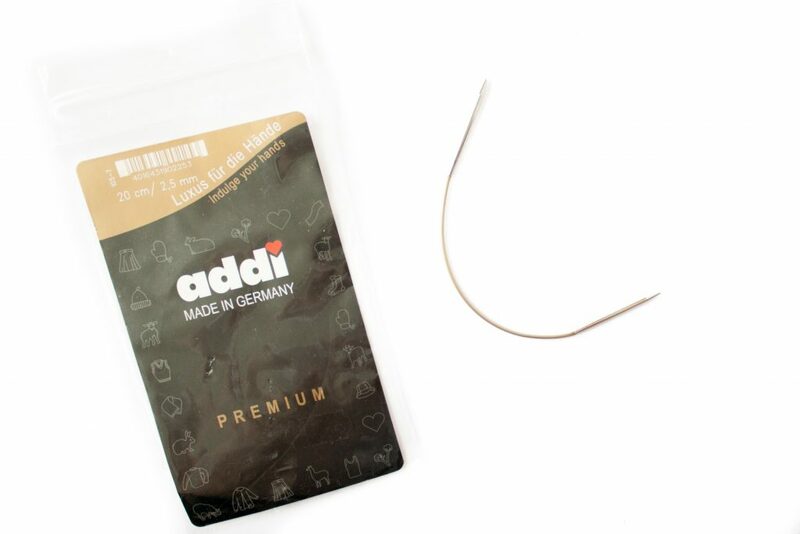 Each half sets on a different circular needle and is knitted with this exact circular needle. Each half is independant but as the yarn travels all around the round, it still forms a tube. As I explained at the beginning of this article, there’s no ideal method to knit in the round. I still switch between techniques depending on the kind of project, my needle size or even the weather! What’s your preferred technique? Do you know alternatives? All stitches markers featured here can be found in my Etsy shop. Join the Tisserin Brood to received exclusive contents every other week here.